When I found out I was having a daughter, I was overjoyed. I looked forward to dressing her up and of course doing her hair. Being a mother to my 7 year old baby girl has been a pure joy and although she is growing up with thoughts and starting to make decisions on her own – I still get joy from doing the even the simplest things for her. I have always been a hair person. Doing hair was actually my first business in high school. My friends used to come over my house and let me spiral curl their hair. Now, if you fast forward to 2015 my friends are still coming over, but now they want crochet styles. The love for hair has trickled down to my daughter who at 7 has already learned to braid and twist hair. She has a mini hair mannequin and will sit and learn new styles. Sometimes, she will even style the dolls hair as an option for what she wants me to try on her hair. Recently she asked me to try just for me! 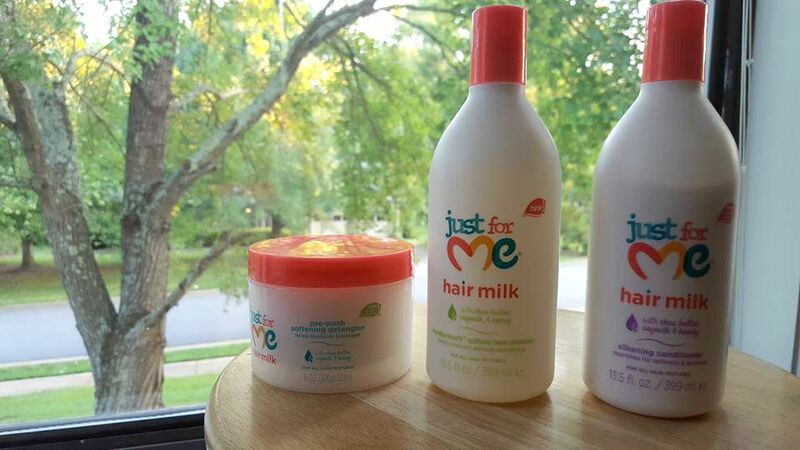 The just for me product line, which can be bought at Walmart, has been around for years. I’ve even used their products (in my 20’s) before. I am not sure why I never thought to use them for my daughter. Well, I see that I have been missing out on a true treasure after using this hair milk line on Bailee. I was immediately mad at anyone who kept this to themselves. We decided to go for a twisted mohawk on Ms. Bailee this weekend. She was wearing a ponytail and twist out all week, so we knew a good 5 finger detangling would be in our future. We tried the just for me moisture soft sulfate free cleanser and it soaked through from root to her ends. Bailee’s hair is so thick, that we have to detangle it during the shampoo and condition stage. With this shampoo, I was able to run my fingers through her hair from root to ends. After conditioning, then styling with the leave-in detangler and conditioner, her hair was so SOFT and DEFINED. She had to ask me to stop touching her hair! We created a video to show you the process with before and after footage. It’s a short 4 minutes video so be sure to watch it to the end. I literally felt like I found a pot of gold in these products. 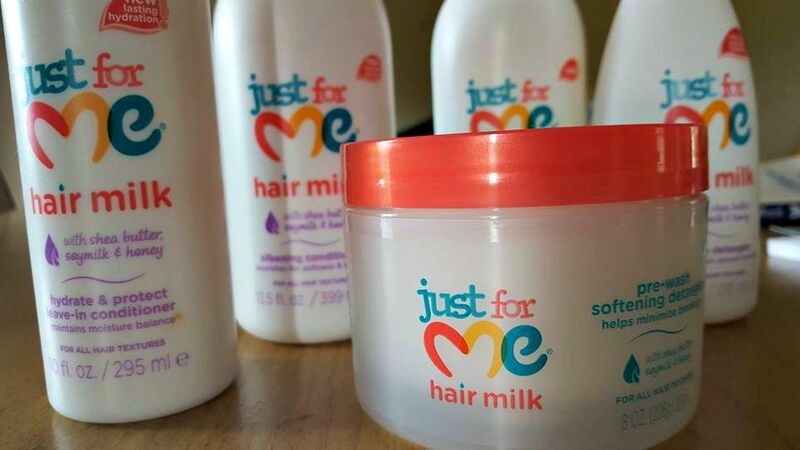 Product list: The new just for me hair milk line (retail $5.49) is infused with shea butter, soy milk & honey. 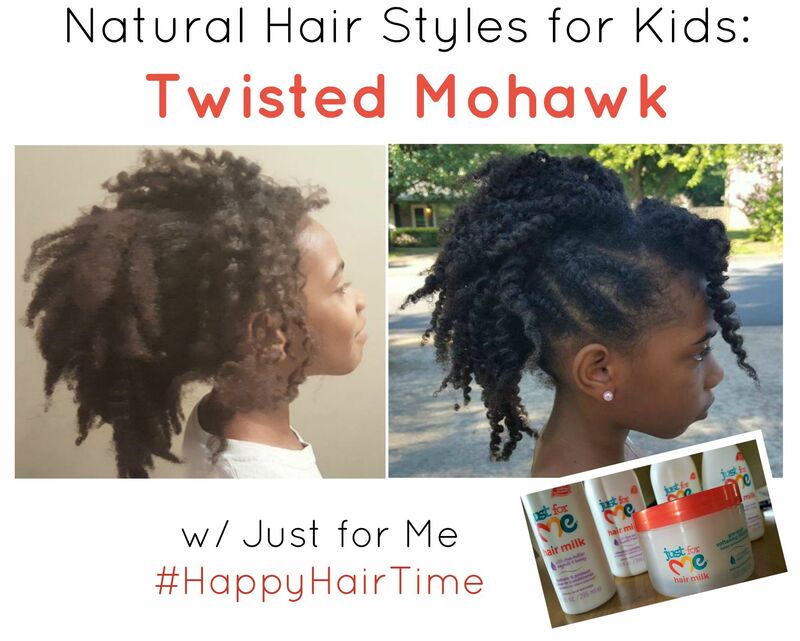 It provided worry free manageability to your daughter’s naturally textured hair. pre-wash soften dangler | softens and smoothes, easing pre-wash detangling to minimize breakage from coming. moisture sulfate free cleanser | provides a gentle non-drying, sulfate free alternative that cleans hair without compromising the creamy rich later you love. Hair is left feeling soft, hydrated, and shiny. Silkening conditioner | nourished & strengthens hair by protecting against breakage. Hair is left feeling smooth, silky & soft. 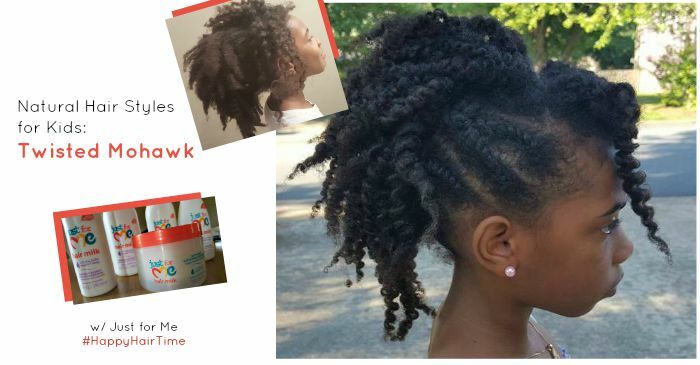 leave-in detangler | untangles even the toughest tangles and knots. Helps restore moisture, flexibility, and shine. hydrate & protect leave in conditioner | nourishes & smoothes hair while providing continuous hydration. Hair is left feeling soft & supple. I really like this product line and I will be purchasing more when we run out! I feel that I’ve finally found a product line that works for my daughters hair and making her feel special at the same time. I challenge you to try the 5 finger test on your daughter. 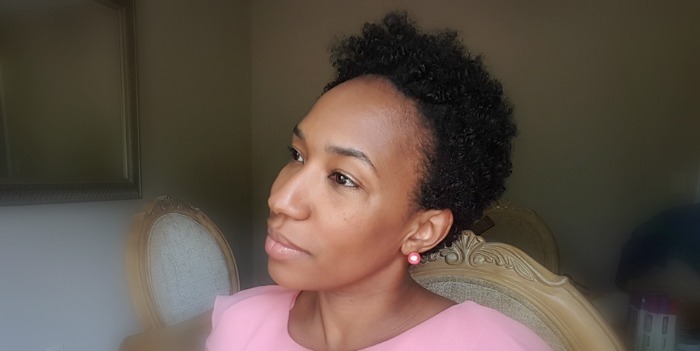 As a women who wears my hair natural and raising a daughter with a similar texture, sometimes combing straight through can be a challenge. Many women comb through the hair with their fingers. It makes it easier to part and manage. With these products it makes it easier to use your 5 fingers during the shampoo stage. I love that! Have you ever used just for me before? What were your results? Love the hairstyle! My gbaby should try these products. 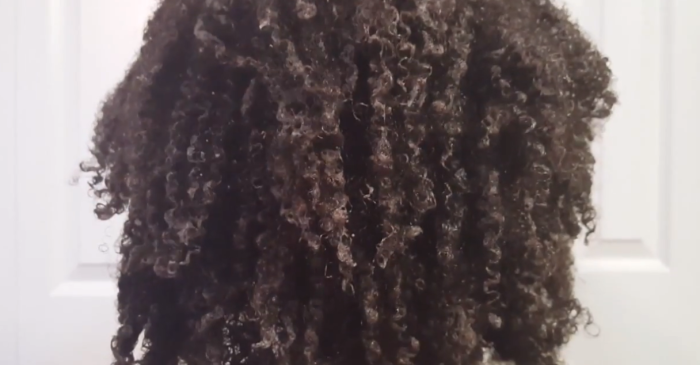 We’re looking for products that will help hair her natural hair. Very cute hairstyle. I’ve seen the just for me line in the store but have yet to test it out. Thanks for the review! 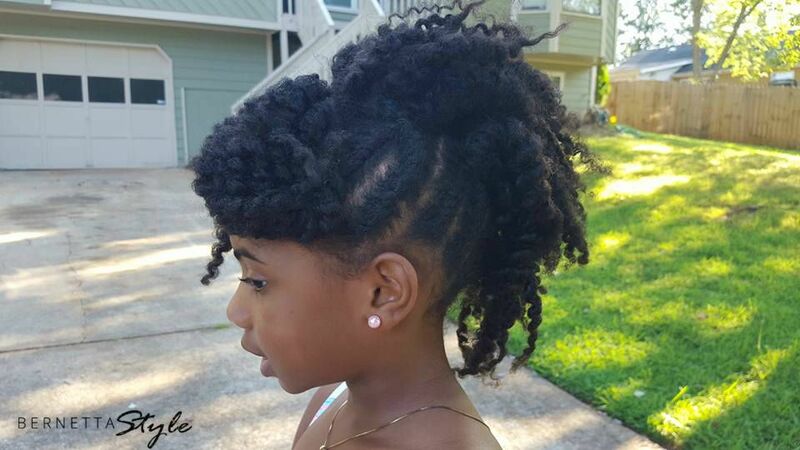 My daughter’s hair is natural as well and it’s texture is very finite spiral curls. While washing her hair this weekend, we had to really massage her scalp because it had been in a protective style for the summer. Due to the scalp massage, her hair became tangled and good grief, it took me a few minutes to detangle. You may have given me a new option. I can’t wait to try it. Your daughter is too cute and her hair is gorgeous. I didn’t know about this line either but might have to check it out now for my girls.